Elemental forces manifest themselves in steel and diesel in Steven Spielberg's first feature film. Elemental forces manifest themselves in steel and diesel in Steven Spielberg's first feature film. 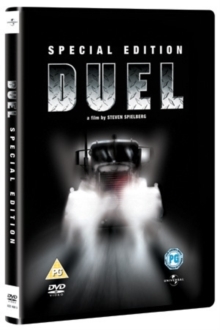 Businessman David Mann (Dennis Weaver) is driving on a lonely stretch of highway when he notices that he is being followed by a huge, menacing diesel truck. The truck then starts trying to push him off the road, and despite Mann's attempts to defuse the situation, it soon has him engaged in a punishing duel to the death. Originally made for American television but given a cinema release in the UK, this was director Steven Spielberg's feature debut. Businessman David Mann (Dennis Weaver) is driving on a lonely stretch of highway when he notices that he is being followed by a huge, menacing diesel truck. The truck then starts trying to push him off the road, and despite Mann's attempts to defuse the situation, it soon has him engaged in a punishing duel to the death. Originally made for American television but given a cinema release in the UK, this was director Steven Spielberg's feature debut.